Wireless Bollinger wrote a review of Jump Out The Window. We learn that “the main shock with Orouni is that they are not painfully irritating” and “they may actually be quiet, emotionally intelligent people whose sensitivity is not a complete fabrication”. On Thursday, March 19th, Dana Boulé and David Franck Keller will play at Onze Bar. You should go and see them. I like both of their works very much. Tonight, with Mlie, we’ll sing two beautiful Pavement songs at Le Motel in Paris. The tribute night starts around 7 pm. 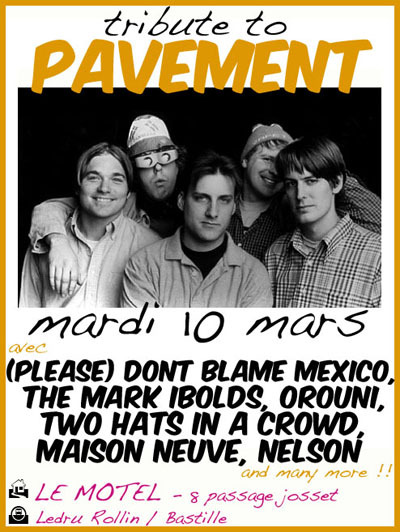 (Please) Don’t Blame Mexico and Maison Neuve will also do some covers. We will play on Monday, March 9th at La Flèche d’Or. We’ll miss DFK, our bass player. A. You are a kid and you are old enough to know how to read. B. You are a parent, lost on the web. C. You tried to find new ways to sleep well with Google and it led you here. 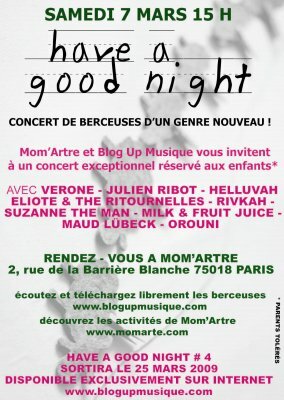 D. You like Verone, Julien Ribot, Helluvah, EliotE & the Ritournelles, Rivkah, Suzanne The Man, MiLK & Fruit Juice or Maud Lübeck. Anyway, you can come (or at least try) and see us play! We are playing at La Flèche d’Or next Monday (March 9th). Please come early, we’ll play first.